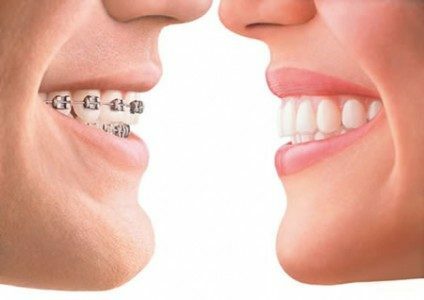 The aim of metal braces is to straighten out crooked teeth. Metal braces are very strong and can withstand most types of treatment. They consist of very small metal brackets (attachments) that are glued to the front of your teeth. A metal wire is attached to the brackets and held by ligatures. If you're unhappy with your smile, having a detailed consultation with your dentist can determine whether or not braces are needed. Although metal braces are the fastest method of straightening out teeth, the treatment time is dependent the severity of their crooked teeth. Most dentists will give a time frame between 1-2 years, however this could be longer or shorter, dependent on the patient. How are my braces made to fit me? Prior to getting your braces, you will have a consultation with your dentist. At this consultation, X-rays will be taken and molds will be made in order for your brace to be created perfectly for you. Both of these processes are pain free. Although the process of having braces fitted doesn't hurt, you may experience an aching sensation when you first get them and when they are tightened as you go through your treatment. This doesn't usually last more than a few days and can be treated with painkillers. Habits e.g. Nail biting and chewing your pen or pencil can damage or break your brace. Can I play musical instruments? Avoid fizzy drinks, sodas, pops, carbonated drinks and natural fruit juices, as these are often high in sugar and can be acidic. This can lead to tooth decay and erosion. Fizzy drinks can also stain the brackets of your brace. If you do drink these types of drinks, don't sip the drink - use a straw instead. Water and plain milk are the safest drinks. Book a consultation now for more information on how we can help you with Fixed Metal Braces.